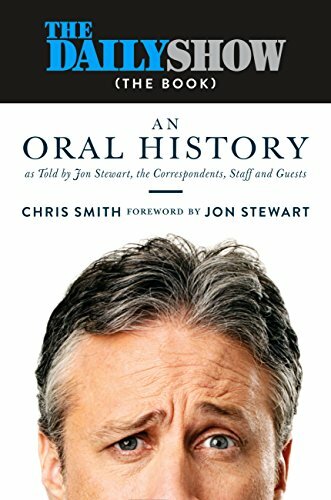 An oral history of the news satire and talk show as told by Jon Stewart, the correspondents, staff and guests. Fortunately, most every one interviewed—from Stephen Colbert to longtime showrunner Ben Karlin to Sen. John McCain—possesses an A-plus wit ... it doesn’t flinch from digging into the show’s most contentious moments and making the star himself slightly squirm ... in the Age of Trump, the time has never been better to delve into the minds of the masters who became a vital part of our democracy. Although the day-to-day grind of producing the show often blinded Stewart and his team from the effect they were having outside the studio, the book gives a fuller picture of how their targeted outrage affected the culture ... The book revels in the wonky details of creating a segment: the morning discussion of the day’s issues; the endless drafts and revisions, even the frenzied period after rehearsal ... Along with all these minor detonations, The Daily Show (The Book) offers a satisfying highlight reel of the show’s achievements...Readers of this compelling history will appreciate the sweat behind every joke. ...this book seeks a serious understanding of everything about him, especially the thinking that shaped the show. But Mr. Smith lets hero worship and repetition slow the book’s momentum. And doses of snark from embittered ex-staffers sound like exactly what they are ... He omits transcript material that’s important to the show’s history...It would have been worth the extra space to remind readers what Mr. Stewart sounds like when he’s in a cold fury ... Mr. Smith carefully follows the show’s arc to the start of the war in Iraq and the video-clip milestone that had the show staging Bush vs. Bush debates comparing Gov. George W. Bush’s statements about Iraq with those of President George W. Bush. What did you think of The Daily Show (The Book): An Oral History?